“Gender Equality is not a Women’s Issue, but it is a Human’s issue”. India ranks 132 out of 187 countries on the gender inequality index, according to the United Nations Development Program’s Human Development Report 2013. Gender inequality is especially tragic not only because it excludes women from basic social opportunities, but also because it gravely imperils the life prospects of future generations. TARA Projects, jointly with its partner organisations Oxfam Magasins du Monde – Belgium, Sasha – Kolkata and Corr- The Jute Works – Bangladesh launched a campaign ‘Let’s Work Together! For Gender Equality’ on 07th November, 2015 at Sangam Vihar, Delhi with other events held at Badarpur, Bawana, Delhi and Manav Rachna University, Faridabad. The program was attended by eminent persons from the Government department, civil society organizations, media persons, college students and others from the community. The program was attended by eminent persons from the Government department, civil society organizations, media persons, college students and others from the community. More than 700 people participated in the program. In the main launching event, more than 400 people participated. Speaking on this occasion, the local MLA, Delhi Govt. 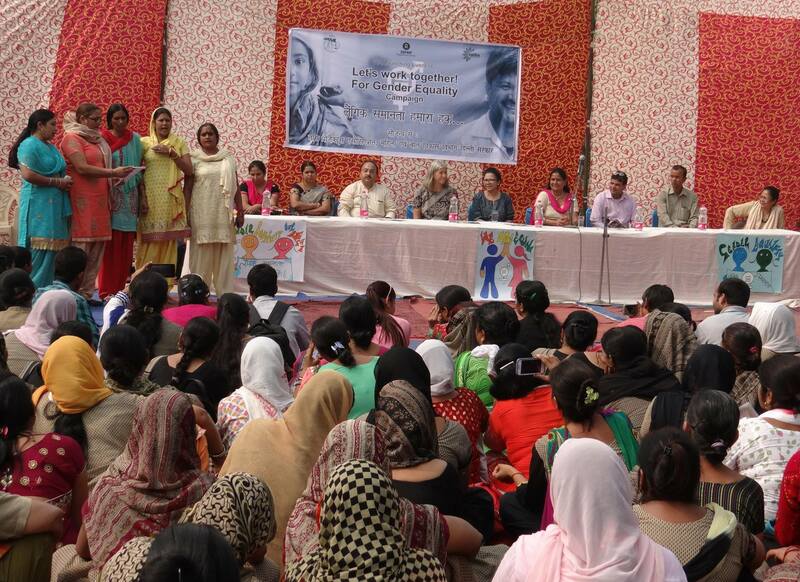 Mr. Prakash Jarwal urged the men and women to jointly address the issue of Gender. He urged the parents, the youth and the leaders of the society to improve the present status of gender inequality in the society. Ms. 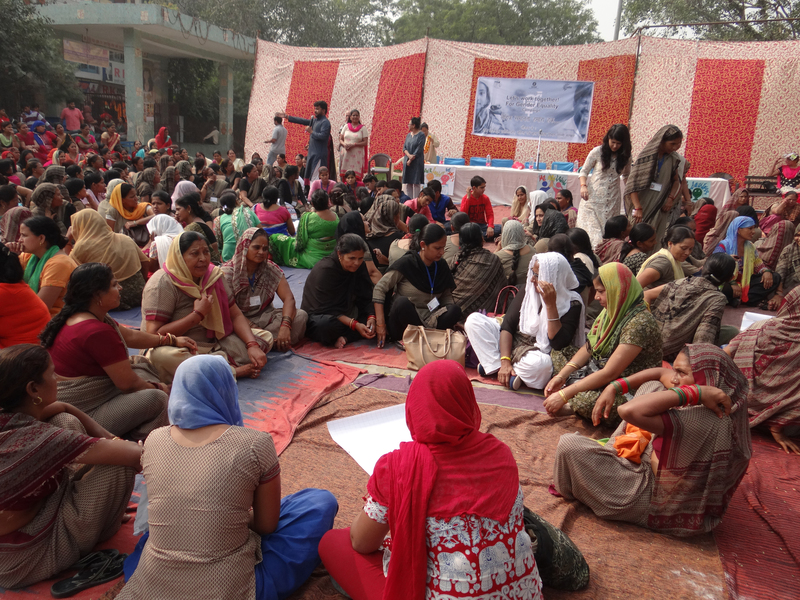 Moon Sharma reiterated Tara Project’s commitment to fight gender inequality in the society. She spoke about how Fair Trade has been able to make difference in the lives of many, changing people’s mindset. She also said that this is just the launching of this campaign and it will be followed by more action in the time to come. With this message, she officially together with the MLA and the other eminent personalities launched the campaign “Lets work together for Gender Equality”. As a symbolic gesture, all the guests on the stage and the participants wore the T-Shirts signifying their support for Gender Equality. 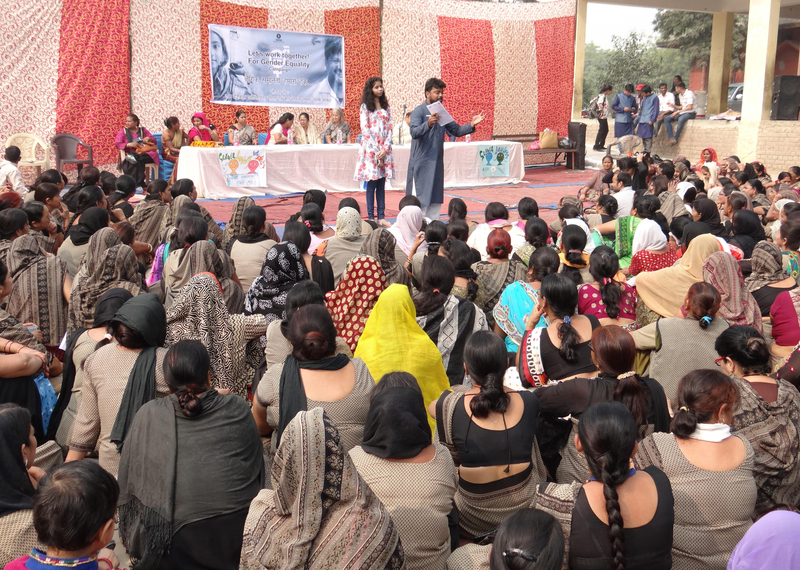 A series of events, role plays, songs, group activities and a street play were also performed. These focused on the present status of gender inequality in our society and the changes required. 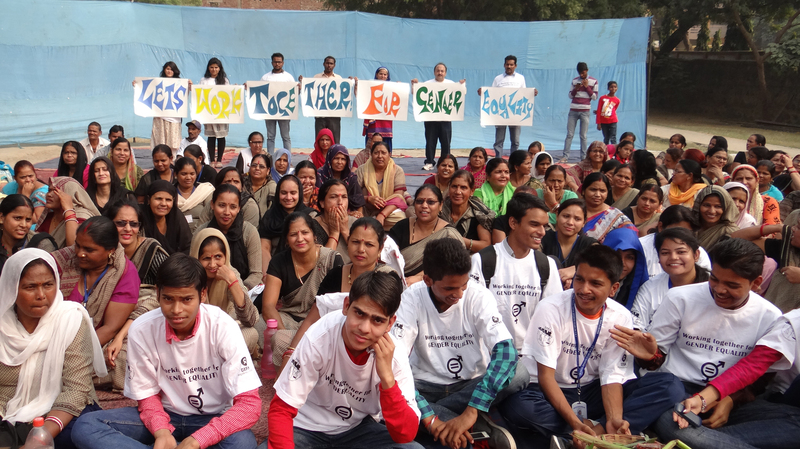 The launching event increased the awareness about the need for Gender Equality among the participants. The group activity conducted, brought out many new significant issues related with Gender Inequality and brought about participation from the community stakeholders on the issue. A great enthusiasm could be noticed among the participants in supporting the cause of Gender Equality.